TEC Computer Accessory Case - Medium Black. 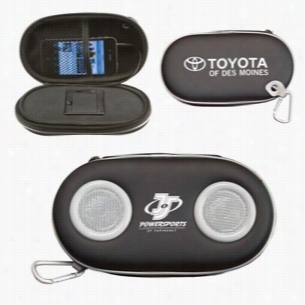 Portable Amplified Stereo Speaker Case with Carabiner Clip. The Amplified Stereo Speaker Case turns your iPod or MP3 player into a portable sound system allowing you to share your music anytime, anywhere! The speaker case is compact, measuring a mere 7-3/4" long, but the 2" dual stereo speakers produce a big sound, providing you with crisp and clear audio. The sturdy water-resistant case zips closed to protect your iPhone, iPod or MP3 player from the elements and is ideal for use when biking, hiking, camping, exercising or at the beach. Handy carabiner clip securely attaches speakers to your belt, bag, or key ring. MP3/iPod Waterproof Case with Water-Resistant Earbuds. 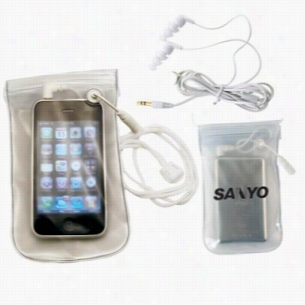 Waterproof MP3 Case only. The case is 100% waterproof when closed and also protects from dust, dirt, and sand allowing you to use your iPod, iPod nano or Shuffle with peace of mind at the beach, pool, river, lake, gym or walking in the rain. Made of sturdy flexible clear vinyl, this case allows clear screen visibility and features Velcro-style closure, waterproof headphone connector and adjustable neck cord. Conductive material allows your capacitive touch screen to be used while your device is still in the bag. Custom Earbuds Colored In Square Case. Tough Tech Two Case set. 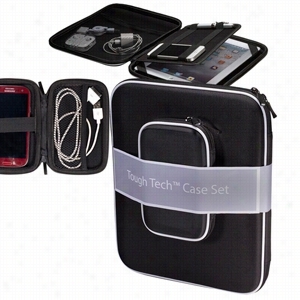 Includes the Tough Techâ„¢ Tablet Case and the Tough Techâ„¢ Accessory Case. Both items are made from rigid EVA plastic with 1680d Polyester cover. Internal elastic mesh pocket and elastic straps. Dual-zippered closure with contrasting piping. 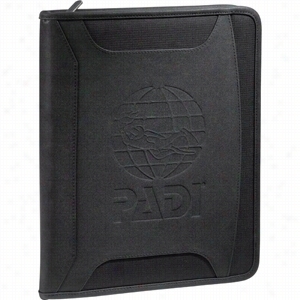 Tablet case features internal tablet flap with elastic straps can be used to form a stand. Smaller internal flap with elastic straps for batteries, power cords and other accessories. Case Logic Conversion Zippered Tech Journal. Fine Society Sophia Jewelry & Cosmetic Case. Classic and subtly stylish jewelry and cosmetic Case combo. Inspired by the sophisticated woman, this case features two separated zippered compartments for the ultimate organizational travel essential. 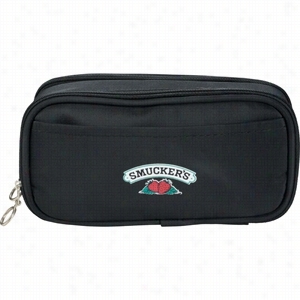 One zippered compartment is designed for cosmetic needs with a pocket for your brushes and main section for makeup. The other zippered compartment is designed for your jewelry with necklace hooks, earing page for all sizes, and 2 additional organizational pouches. Front Velcro pocket for additional storage. Comes with Sophia hangtag to tell you just who Sophia is. Material: Vinyl. Manufactured By Leeds. Earbuds with Microphone in Square Case. In-ear headphones with microphone â€“ designed for use with smartphones such as iPhones, as well as on computers and tablets with microphone and sound capabilities. Speak directly into microphone panel for optimal quality. 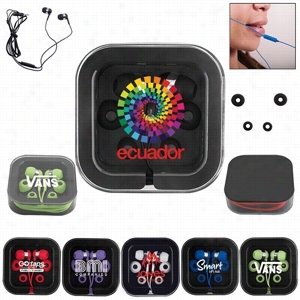 Headphones made of PU plastic cord with silicone earbuds and are approx. 31"L. Includes 3 different sized interchangeable buds for the most comfortable fit for your ear [Ear bud sizes: 0.39" (0.9cm), 0.43" (1.1cm), 0.47" (1.2cm)] Buds come packed in compact square ABS plastic Case. Cord wraps around the case to keep from tangling when not in use. Note: Printing available on case only. Power supply / Technology: Frequency Range: 20Hz-20,000 Hz, Sensitivity: 108Â±3dB S.P.L. at 1KHz, Input 50mW, Impedance 32ohms, Driver, Unit F10mm, Plug Type 3.5mm Stereo. California Innovations Pack & Hang Insert with Case. Organized travel is redefined with the pack and hang insert from California Innovations. Patent pending portable shelving system keeps your clothes folded and organized. Less than 17" wide, it fits into most carry-on luggage 19" and above and lets you unpack in seconds. Equipped with a hook for hanging in a closet, on a door, on a chair, or anywhere acts as your portable closet. Keeps your clothes away from critters such as bed bugs that can be found in drawers. Comes with a carrying Case that can double as a travel Bag. 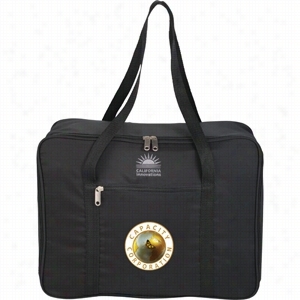 Carrying bag includes one main compartment, front zippered pocket for additional storage, and webbed handles. 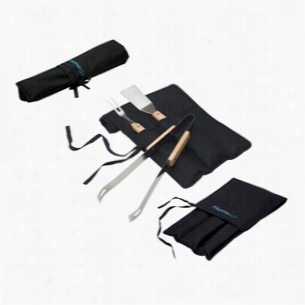 Easily folds up and snaps closed for easy storage. Material: 150d and 210d Polyester with PU Backing. Manufactured By Leeds.